Bletchley Park remained the incognito headquarter of Britain's code-breaking effort throughout the Second World War, as seen in the excellent movie The Imitation Game. That was a true secret installation because its real purpose was only known to a few friendly cognoscenti. Just like Churchill's secret bunker in a disaffected tube station under London during WWII, Bletchley Park was hiding in plain sight. That was pretty cheeky, and funny, coming from an agency that constantly deals in acquiring and keeping secrets. But it was a good example of an outside look at what we can only look at, only what they allow us to see. Now, look at a real almost-secret installation: Cheyenne Mountain Complex. Photos of the entrance of the main tunnel of the installation are literally all over the place for everyone to see. Documentaries, specs, you name it. It was even the supposed setting for a sci-fi TV show! Yet, nobody mentions the possibility of there being, say, secret air supply accesses and escape tunnels from the Complex. So confident are they in their security systems that they're plastering pictures of the main entrance all over the Internet to give you a 'Carry on. Nothing to see here. Carry on.' feeling, while not even hinting at the real hush-hush stuff. Here are a few chosen off-limits places. Except for the last one, most everyone suspects or knows there are secret shenanigans going on, but nobody has access except for people who work there, sworn to secrecy. Area 51 is also one of those, but we'll avoid that subject because there's just too much fringe, aluminum-foil-hat hoop-la that gravitates around it. At 33 Thomas street, between Broadway and Church streets in Manhattan, New York City, lies a mysterious entity that one informed source says features the tallest blank wall in the world, for nary a window mars its smooth surfaces, only ventilation ducts and not too many of those either. It was built in 1974 in the spirit of Cold War paranoia. Truly, the Long Lines Building is 29 stories of monolithic, brutalist weirdness; a fortress that's been called the most secure building in America. Its ceilings are 18 feet high, and the floors can carry up to 300 pounds per square foot. The building was built to be self-sufficient and fallout resistant. One can only imagine the measure of those walls, for they were built thick enough to withstand an indirect atomic blast. Most of us have seen windowless telecommunications buildings that are built inside the shell of repurposed old factories or warehouses, with dark temperature proofed or walled-up windows. But this place takes it quite a few steps further; it was built that way. Looking at its imposing but mute ugliness, one would surmise that the name Long Lines comes from its appearance, but that would be false. Rather, Long Lines refers to AT&T's overseas communications equipment. If you're somewhere in Europe and happen to phone your granny in Holyoke, Massachusetts; chances are that the hardware and software in the datacenter inside the Long Lines Building has recorded and analyzed the hell out of that call. So, now a secret agency of the U.S. government knows the recipe for your granny's famous pumpkin pie. Unfortunately, that very same top-secret government SIGINT spy agency could not prevent eighty percent of the biggest British companies from suffering serious cyberattacks that cost the UK economy millions of pounds annually. Its doughnut-shaped design reflects the building philosophy that rejects enclosed offices to encourage large open spaces and conversation between employees, of which Apple Park is another example. Every employee is said to be within five minutes of every other. This is very well and good as most intelligence work relies on constant exchange of information, communication and brainstorming between experts, often in different field. It's also a criminal offense for a person to trespass onto the site, and the security apparatus surrounding the place is, as expected, through the roof. 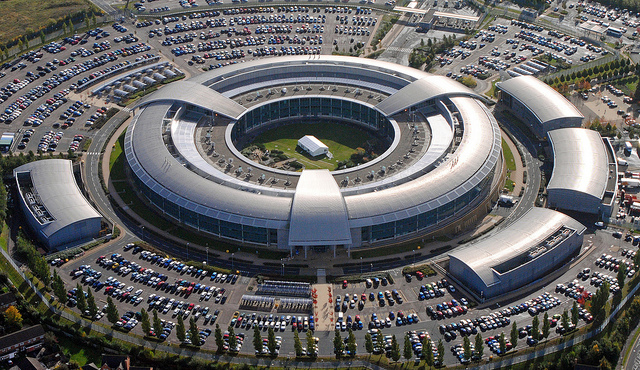 In the middle of the Donut is a park under which GCHQ's supercomputers are housed. Ironically, this writer notes that the overall shape of the structure seems to be reminiscent of data reel tape cases or some such, that were used in old-timey computer rooms sometime after Turing's days. First, a little history, as is sometimes our wont to do here. You shall see that this very area may be somewhat, somehow... damned. known as Saltychikha, was a Russian noblewoman, sadist, and serial killer from Moscow, who became notorious for torturing and killing more than one hundred of her serfs, mostly women and girls. Darya Nikolayevna Saltykova was a noblewoman, but also a serial killer, who lived near the Lubyanka building almost a century and a half before it was built. She tortured and killed servants for pleasure; whipping, scalping, setting their hair on fire, pouring boiling water on them. She enjoyed all the impunity that bribes and her belonging to the aristocracy could afford her for some years, but in the end, she was arrested in 1762 and convicted in 1768 for 38 provable sadistic murders, although estimates run into the high hundred. The reason for her demise was that Catherine The Great finally got wind of her horrible misdeeds. But Saltychikha being a noblewoman, the Empress couldn't have her executed like some lowly you or I and anyway the death penalty, in a surprisingly progressive move, had been abolished in Russia in 1754. So Salty spent 11 years in a cellar under a convent and another 33 years in an outbuilding cell. She thus spent the last 44 years of her life in solitary. One hopes she enjoyed her own company. She was a woman so awful that Empress Catherine had her declared a man. Now on to the Lubyanka. This landmark of Soviet horror stands in front of Lubyanka Square in the Meshchansky District of central Moscow. Until 1991, the square in front of it was named Dzerzhinsky Square after the founder of the first socialist secret police, the Cheka. Its construction started in 1897 and, in the beginning, it housed the headquarters of an insurance company. This changed with the Bolshevik Revolution of 1917 as the insurance company was kicked out and the building seized to house the newly formed Cheka, an ancestor to the KGB and then the FSB, that still occupies part of it. Since its construction, the structure went through a few phases of development and enlargement. The silence at night in the prison was almost total, except for the occasional wail. The guards were not permitted to talk and communicated by clicking their tongue. The prison still occupies the first floor. It will come as a surprise to no one that spies and dissidents of all stripes were taken from there to be interrogated and tortured in the basement. Accused of anti-Soviet propaganda, writer Aleksandr Solzhenitsyn was imprisoned there and then condemned to eight years in a gulag. One could say he was lucky because quite a few of the inmates, like Leon Trotsky or the daredevil spy Sidney Reilly, ended up in the Lubyanka morgue or maybe even deeper. The 'meat grinder' was the euphemism used to refer to the Soviet interrogation methods, but an unsubstantiated rumor has it that the Lubyanka's basement connects to tunnels that eventually lead to a room where a large industrial meat grinder, a real one, took care of the bodies of those the KGB had tortured to death, dumping the resulting wet organic mess directly in the Moscow sewer system. Just a rumor, but also kind of logical... and the ground floor windows still have bars on them. And finally, another place that you can see from the outside where you can't go, even though the only secrets it conceals are old, very sad ones : the Verdun Forbidden Forest. 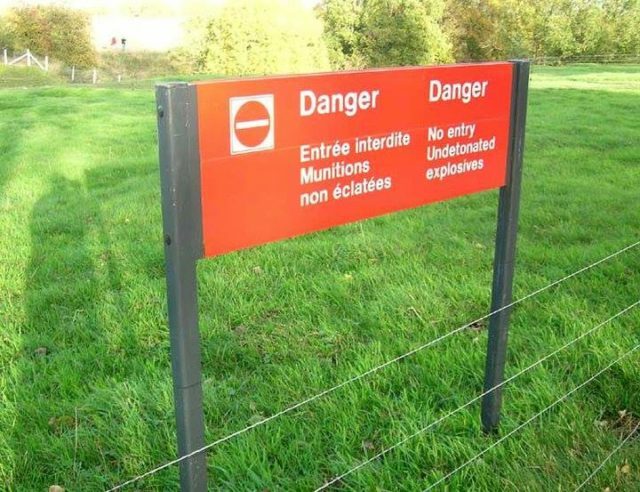 After the terrible battle of Verdun, which left the region a desolate, mangled wreck, an elongated part of it corresponding to the front lines was designated as la Zone Rouge, aka the Red Zone. Originally, it covered four hundred and sixty square miles, but this was eventually pared down to a still-considerable surface roughly the size of Paris, where many entire villages had been eradicated and never rebuilt. A land reclaiming project, the Verdun National Forest in north-east France, covers 10,000 hectares. It was cleared of all manners of ordnance and partly replanted, but those old tools of death keep percolating upwards and eventually litter the ground. Like Chernobyl, the Red Zone was deemed uninhabitable and became another exclusion zone. The only people who went through there were hunters. When nature began rather quickly to take over right after WWI every tree, every bush, every blade of grass had been nourished by the flesh and bones of the impossible amount of human and animal remains left in the ground. Over the course of three hundred days in the year 1916, three hundred thousand French and German soldiers perished there. But that's not all: every manner of ordnance, unexploded artillery shells, some wider and taller than a man, still-live poison gas shells, grenades, lead shot, shrapnel, bullets, and rifles are still deteriorating and poisoning the ground. All that is left of the farmland that used to be there are fields and forests pockmarked by craters every few feet. There are extremely toxic areas where, a century later, the land is a desert where everything that attempts to grow, dies. Five hundred and forty four municipalities that still exist in the area are forbidden to drink the local water because of the dangerous amounts of perchlorate it contains, a by-product of ordnance manufacture, and fulminates, used to make detonators. Do you remember those hunters who still hunted there? They can't anymore. In 2004, scientists found out that the ground was up to 17% composed of arsenic, that the water had 300 times more of it than deemed tolerable, and the animals had impressive amounts of lead and cadmium in their livers. The lead, mercury, and zinc contaminating the area are expected to remain in the ground for 10,000 years. And that's the kind of war it was.